In this romantic wedding photo at Keystone Ranch, the bride and groom share an intimate moment as the sun peeked through the clouds and is about to go down over the mountains. Although it seems like a simple portrait, there's more going on that I thought about to make sure the photograph stands out. As the photographer I positioned myself so that I could capture the sun from behind so that it perfectly rim lit the couple. Although I didn't direct the couple for posing, the bride leaning to the left allowed the sun to kiss her face and highlight her loving expression. I did capture the actual kiss, but once their faces come together I lost that light on her face. I feel like kisses can sometimes look like they are smushing their faces together, and it's not always flattering. I also made sure to get the darker green forest behind their heads to act as a backdrop from which their heads could stand out from. Keystone Ranch has a rustic charm that comes from it frontier days feel with a 1930's ranch homestead and its old cabins. The ceremony venue overlooks the lush green grass of a golf course, with a wedding capacity of up to 180 guests in the summer and 120 in the winter. You can still find the open tall grass look that I find more natural, but I like vibrant colors also. Keystone Ranch is part of Keystone Resorts and is located in Keystone, Colorado. 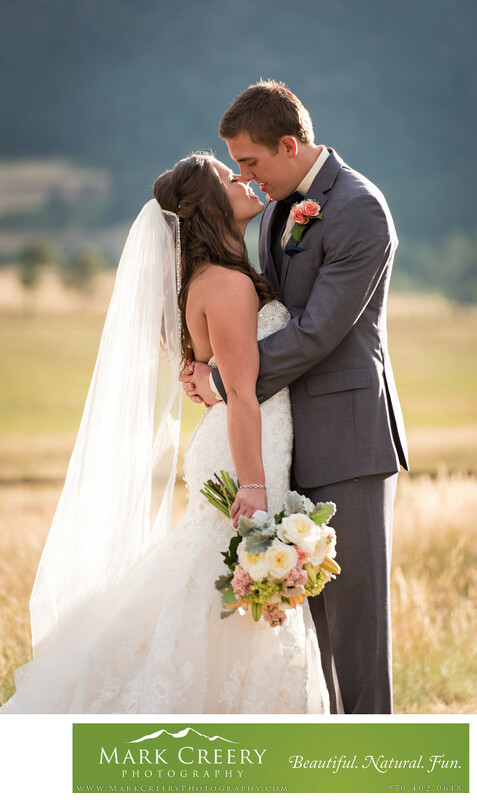 Contact: (877) 625-1541, KeystoneWeddings@vailresorts.com. Location: 1437 Co Rd 150, Keystone, CO 80435.